Please note, that if you are purchasing plans thru paypal, include the plans you are ordering in the notes thru paypal... will make processing orders faster and avoid delays! Thanks for your orders and understanding! Bob and Arlene Mears have aquired Barry Baxters controllineplans site to ensure that all his work and dedication to the hobby are preserved. We hope to continue selling plans to all who wish to keep building and promoting the sport. Our drawings have been updated to plotted drawings from digital scans instead of the old bluelines. They have been restored to get rid of the background clag and look like original issue. The same rapid service is still available, and I'm trying to hold prices at the current level, but postage is the big price increase driver. A new free catalog is now available online. E-mail me to get a .PDF file. Snail Mail price is $4.00. See Order Page for addresses. If I have a construction article for a plan that is ordered, it will be Emailed to you. Barry Baxter and his original T-Square, the model with which he learned to fly controlline. 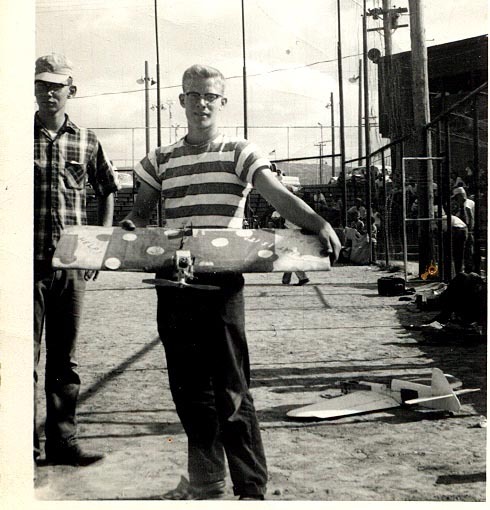 The photo was taken at his first combat contest, three weeks after completing the model and learning to fly C/L. The guy on the left is Barry's old flying buddy, Gene Corson, who now owns a hobby shop in Wyoming. This Site dedicated to the preservation and dispensation of over 300 Model Airplane Combat and Stunt Plans from the experimental years of the 1950s and early 1960s. I have been interested in the designs and have been collecting and reproducing these plans as a hobby for over 50 years. There was much experimentation with novel ideas in wing planform, airfoils and control systems that led to a wide array of designs, each with its own characteristics and charm. Some were great, some weren't so hot, but they are all represented here. There are many plans available here that are not available anywhere else. These were originally published as assembly drawings from kits, such as the T-Square, Flite Streak, Super Ringmaster and Reactor. The plans can be found in their respective categories by clicking on the Category button and scanning the alphabetical list. There may be different listings for a particular model, a Ringmaster can be found under Combat Page 2, or the Kits page under Sterling, or the Designers page under Matt Kania. The Index page can also be used to assist you in your search. All plans have an illustration of the model that can be accessed by clicking on the model name. Many of these plans have been drawn to the highest degree of accuracy in AutoCad. Some are from original sources as kit or magazine plans. They are all full size with all the parts shown. We do not redesign any of the original features, except, in some cases, where the original had drawing errors that rendered building or flying impossible; i.e. the top and side view wing chords weren't the same size.